In a market crowded with me-too products, where “price point” is king and bells and whistles unrelated to performance determine a pro duct’s ultimate salability, one company stands out. For as long as I can remember, NAD has bucked the trend toward features for features’ sake. Rather than useless frills, the company’s products offer elegant simplicity. The emphasis is on value, which is to say better-than- average performance for your money. NAD’s latest A/V receiver is a case in point. Set next to a more typical unit, the AV 713 appears stark by com parison. Its businesslike, battleship- gray front panel has relatively few but tons and controls. Those that do appear are large, clearly labeled, and logically laid out. The remote is simple and uncomplicated, although its undifferentiated keys make it difficult to use in the dark. The centrally located fluorescent display is equally straightforward. Large characters spell out the selected source input or—if FM or AM is selected—the tuner frequency and station preset number. A small indicator to the left of the readout indicates which of three surround modes is active: Bypass (stereo), Dolby Pro Logic, or Hall. That’s right: the AV 713 has just three surround modes. But that’s OK by me. The funky music modes and DSP “venues” found on most A/V receivers are totally useless anyway. In fact, it wouldn’t have bothered me if NAD had omitted the Hall mode; intended to provide a surround effect with unencoded music, I found little use for it. You step through the surround modes sequentially by repeatedly pressing the Surround button located on the front panel and remote. I always find this “round robin” method annoying, and it’s particularly irksome here with only three settings to choose from, NAD should have provided dedicated surround-mode buttons. That said, the company redeemed itself somewhat by incorporating one of my favorite features: the last-selected surround mode is memorized and automatically recalled for each input. Speaking of inputs, this is one area in which NAD should have taken a less austere approach. The AV 713 has a mere six inputs total, and only two of these are audio/video inputs. The audio-only inputs are labeled Phono (turntable owners rejoice! ), CD, Tape 1, and Tape 2; both Tape inputs have corresponding outputs. Although a single, mono output is provided and can be used to feed a subwoofer, there are no preamp-outs/main-ins and no high-pass filter to remove bass from the main speakers. The two A/V inputs are generically labeled Video 1 and Video 2. (I prefer specific labels, e.g., VCR1, TV, LDP— they make it easier for other family members to use the system.) Since Video 2 is equipped with an A/V out put, it is best reserved for use with a VCR; I used Video 1 (input only) to connect a laserdisc player. There is a single video Monitor out and no 5- video connectors. The dearth of A/V inputs leads to some real problems, especially if your system is reasonably well equipped. Since there is no dedicated input for TV audio, I connected my TV’s audio output to the Tape 1 input, which works but is hardly intuitive. Users who want to connect a second VCR, DSS receiver, cable box, video game console, or—in the not too distant future—a DVD player will be out of luck. As far as I am concerned, three A/V inputs (plus a dedicated TV audio-only input) is the absolute minimum for any receiver or surround processor. And given today’s ever-expanding range of A/V sources, even five or six may soon not be enough. Before we move on, I’ve got one last complaint concerning the back panel. Although the main front speakers are treated to modified binding posts (these accept banana plugs or bare wire down a slot), the center and surround channels must make do with spring- clip connectors. Boo, hiss! I auditioned the AV 713 in two very different rooms—in fact, in two different houses—over the course of several months. While editing and producing my first issue of SGHT (Spring 1996, Vol. 2 No. 1), I “commuted” from Los Angeles to Santa Fe during the week. My temporary residence was a cozy furnished condo, complete with loads of Southwest charm. .and a cheesy 19- inch TV hooked up to the worst VCR I have ever seen. Keeping my priorities straight, I quickly put together a more viable system. Since the AV 713 was already on hand in Santa Fe waiting for review, I decided to make it the centerpiece of my home theater away from home. With built-in powered woofers and high-efficiency drivers, the Infinity Compositions speaker package seemed a natural complement to the relatively low-powered NAD (more on this later). Source components included a Denon LA-3500 laserdisc player, Marantz MV610 HiFi VCR, and what passes for cable TV here in Santa Fe. The video monitor was a Sony KP 41T15 41-inch rear-projection TV. Entry level Monster interconnects routed the A/V signals to and fro, while generic 16-gauge copper wire fed the speakers. Room treatment consisted of closing the blinds and dimming the lights. Given the ad hoc nature of this system, I made no real attempt to formally evaluate its performance—I just watched, listened, and enjoyed. That I was able to do the latter came as a bit of a surprise. Like all fine loudspeakers, the $3000/pair Infinity Compositions ruthlessly reveal flaws upstream in the audio chain. Nevertheless, at no time did I feel that the NAD was harsh or etched—a common failing of many inexpensive A/V receivers, and one that the Infinity’s would throw into sharp relief. Nor did the NAD rob my favorite audio recordings of their air and detail. The NAD always sounded clean and open, and was quite pleasant to listen to even at fairly loud levels. Although I couldn’t help but gather initial impressions, I tried to reserve final judgment until I could hear the NAD in a more carefully set up environment. I also wanted to hear it with speakers that present a more difficult load than the super-efficient Infinity. The chance came after my family and I relocated permanently to Santa Fe in January. Happily, our new home boasts a separate media room, which measures approximately 18 feet long by 13 feet wide with an 8 high ceiling. This is where all further listening took place. The primary loudspeaker array in my new room is a complete B&W setup: Matrix 801 Anniversary Editions (my long-standing reference) for the main left and right channels, a Matrix HTM for the center, and SCM-S THX dipoles for the surrounds. Because the 801s extend down to 30 Hz, I rarely feel the need for a subwoofer, though I did add a Paradigm PS 1000 powered sub towards the end of the review. As a check, I also used the Infinity Compositions in the new room. 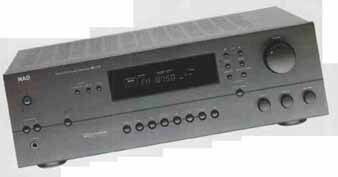 Source components consisted of the same Denon LDP and Marantz VCR used previously, as well as a new Marantz CD-635E CD player. An RCA DSS system was added in mid review, and it’s a welcome supplement to the handful of channels we can pull in with a rooftop antenna (our house is not wired for cable). A Toshiba TP5SESO 55-inch PTV (review forthcoming) replaced the smaller Sony. Audio interconnects were Monster M1000 Mk.III; composite video was carried by M1000V Silver Video. Because the NAD’s spring-clip connectors could not accept the spade lugs on my usual Monster Powerline 2 Plus speaker cables, I again resorted to good ol’ 16-gauge copper wire (it’s what most people who buy a receiver such as this will use, anyway). After calibrating the center and surround levels using the NAD’s built-in test signal and a Radio Shack sound pressure level (SPL) meter, I settled in for an extended laserdisc torture test. Jurassic Park, Apocalypse Now, Star Trek Generations, Casper—I listened in amazement as the NAD not only dealt with scene after punishing scene, but did so even when cranked to 75 dB SPL THX reference level. And this was while driving the big B&W 801s with their 12-inch woofers—no subwoofer was connected. Given these conditions, I wasn’t surprised to hear the NAD exceed its limits on some of the more demanding scenes. However, it did so gracefully, becoming congested and slightly hard, but never falling apart altogether or becoming distorted and unlistenable as with some other receivers I have reviewed. At no time did I feel tempted to engage NAD’s Soft Clipping circuit (the switch is on the back panel), although there were a few times where I had to turn things down a few dB. That said, during the sonically intense (and physically improbable) saucer separation and crash-landing sequence on Generations, my wife walked into the room and shouted, “This sounds great!” My thoughts exactly. Of course, the NAD was nowhere near the equal of the $3700 Marantz/Chiro package in terms of bass extension, impact, dynamic range, and detail, but that’s to be expected. ‘What one does not expect is for such a modest receiver to be not only listenable, but enjoyable to listen to even when driving a demanding load to ridiculous levels. Although you might not know it from trade show demos, there’s more to home-theater sound than helicopters, dinosaur stomps, and cosmic string fragments. The magnificent IMAX transfer of Africa: the Serengeti is narrated by James Earl Jones. If ever there was a great test signal, his sepulchral voice is it. The NAD issued him forth solidly and intelligibly, while simultaneously reproducing thundering wildebeest herds, booming thunder storms, superb Foley effects, and a magnificent and dynamic musical score. And even with only 15 Wpc, the surrounds had no trouble recreating this must-own disc’s enveloping outdoor ambience. There’s also more to home theater than, well, theater. In stereo mode, the NAD turned in a fine musical performance, with ample bass and clear highs. If the recording contains dynamics and detail, you hear it through the NAD; even though I know it’s coming, the brass-section entrance on “Moten Swing” on Reference Recordings’ Big Band Basic (RR-63CD) makes me jump every time. If the NAD lacks the high-end resolution and air of a truly fine set of separates, again, that is to be expected. However, for the price, I have heard few receivers that I would recommend so unhesitatingly to my musically inclined friends. As a reviewer, the question I must ultimately answer about a product is: If I were in the market for a unit in this price range, would I buy this one? The answer here is maybe. In terms of sound quality, the NAD AV 713 is a winner, no doubt about it. However, it just doesn’t have enough A/V inputs to be practical as the command center of a full-blown home-theater system. If I were shopping for a receiver to serve in a modest secondary A/V system, say in a bedroom, den, or kid’s room, I would look no farther. The distortion, separation, and frequency response ranged from good to very good in stereo mode, fair to good in Pro Loge. The signal-to-no/se ratio was poor to fair at maximum setting of the level control, but improved to good to very good at typical settings. Clipping ( THD+noise at 1 kHz): L&R channels only, both driven, 71 Wpc into 8 ohms, II I Wpc into 4 ohms; center channel, driven alone, 85 Wpc into 8 ohms. A single surround amplifier drives the surround loudspeakers in series; measured clipping in the surrounds was 23W at each surround loudspeaker output loaded with 8 ohms. Frequency response, surrounds: —7dB at 8 kHz (relative to the maximum at /88 Hz), more rolloff than typical for Pro Logic.